• Call 888 from the GULFSIP number you wish to transfer credit from, and choose “1″ for balance and subscription services. • Choose Transfer credit menu. • Choose the GULFSIP number you wish to transfer credit to and the amount of Transfer. Note: There is 0.1$ fee if you are transferring credit to one of your numbers, and 0.25$ fee if the number isn’t yours.
. Sign in to your account.
. Choose “My Numbers” from your account name menu, a new window will appear with your account numbers.
. Click on “Settings” for the number you wish to transfer credit from . 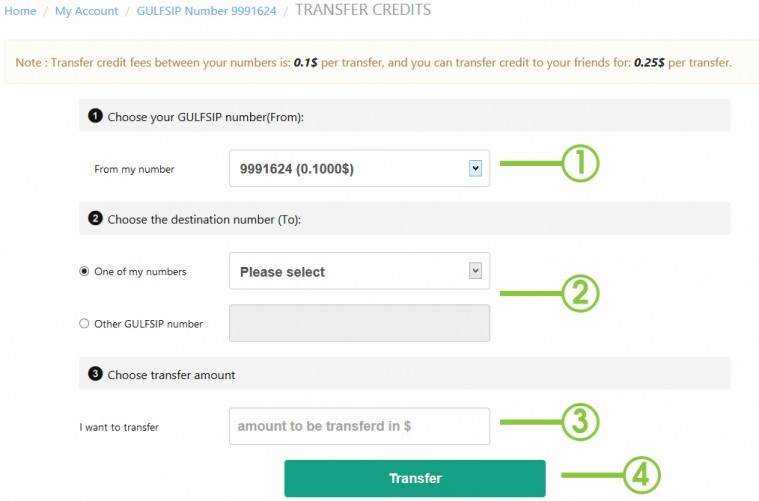 1- Choose your GULFSIP Number that you want to transfer credit from. 2- Choose the destination GULFSIP Number that you want transfer credit to (The two numbers must be active and not expired). 3. Write the amount of balance you wish to transfer. 2. Choose “My Numbers” from your account name menu, a new window will appear with your account numbers. 3. Click on “Settings” for the number you wish to know the transfer history for. • Date and time of the transfer. • The GULFSIP number you transferred credit from. • The GULFSIP number you transferred credit to. • The transferred amount in US Dollars.